Directed by G.W. Pabst in 1929, based by two plays by Wedekind. Louise Brooks stars as Lulu, a young and impulsive vaudeville performer whose raw sexuality and uninhibited nature seemingly brings about the downfall of almost everyone she meets. This theme seems to have been very popular in Europe during the 1920's, featuring famously in Berg's opera. Brooks' naturalistic acting is light years away from the exagerated mannerisms used in early expressionist film, and Pabst's ravishing use of closeup seems completely modern. This is an incredibly dark, fascinating ride. 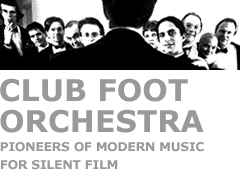 The Club Foot score features compositions by Richard Marriott, Sheldon Brown, Steve Kirk, Matt Brubeck, Myles Boisen, Nik Phelps, Elliot Kavee & Beth Custer. It premiered at the 1995 San Francisco Film Festival at the Castro Theatre. Later that year it enjoyed five sold out shows at Lincoln Center. "The 10 piece San Francisco ensemble... captures every nuance of Brook's performance with it's emotional score." "The over-all tone is a sultry irony worthy of Kurt Weill: a lush, scrappy cynicism that's very Brooks, very Pabst, and very twentieth century."